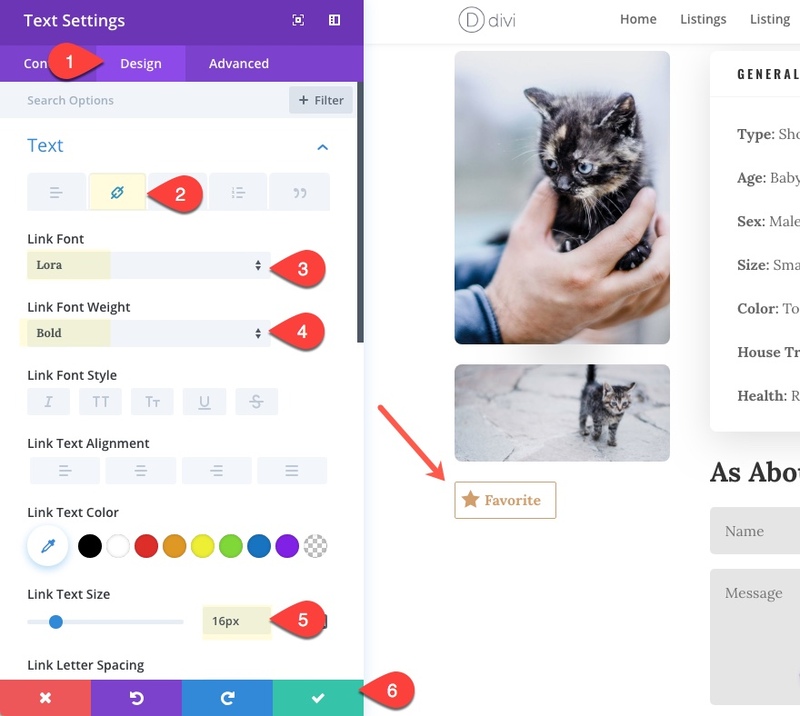 Adding favorite button functionality to your Divi site can be a great boost to user experience. The basic functionality works as a bookmarking system for posts. Users can browse through posts and select the ones they want to favorite. Then users can view those favorited posts later at their convenience. 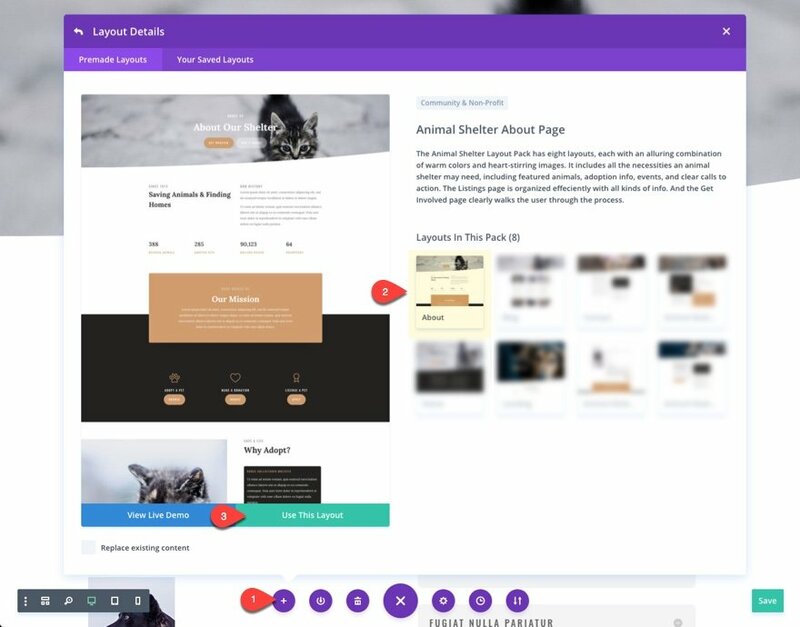 For this use case tutorial, I’m going to show you how to add favorite button functionality to Divi’s Animal Shelter Layout Pack. This will allow the user to select certain pets as their favorite and then view those pets on a separate “my favorites” page. Here is a peek at the favorite button we’ll be adding to our project posts. Here is an peek at the favorites page we’ll be building to show user favorites. 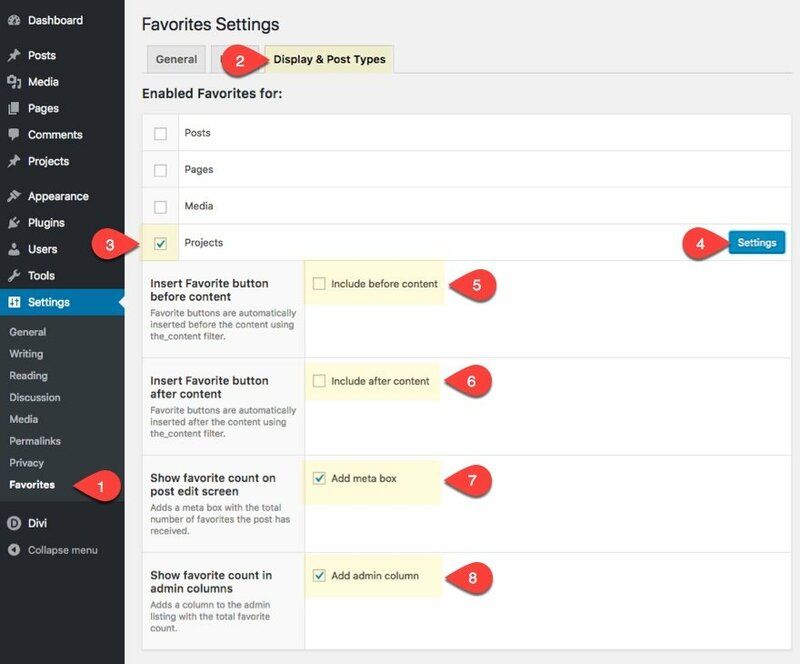 Once the plugin is installed, you can access the settings from the WordPress dashboard by navigating to Settings > Favorites. Click on the Display & Post Types tab on the Favorites Settings page. Then select to enable Projects as the designated post type you want to grant favorite button functionality. Note: You don’t have to set them as projects. You can enable posts or pages if you like. I thought it would be nice to use projects just in case I wanted to use the portfolio module to display my listings down the road. We are not checking the option to include the button before or after content because we are using the Divi Builder. We will use a shortcode to display the button within a text module. Next set the Button HTML Element to “a (link)”. This will allow us to design the link from within the text module later on. Set the Button Type you want to use. I would suggest using the predefined buttons instead of a custom markup, unless you know what you are doing. I’m going to use the Favorite Button Type. You can even preview what the button will look like in the Button Type section above (it’s clickable as well). Under Listings Display, select to customize the favorites list HTML and click the settings button to the right. The primary reason I decided to do this was that I found it difficult to get thumbnails to display with the favorites listing shortcode, so I decided to create a customized output for my listings. By default the favorites list will be displayed in an unordered list with “ul” as the list wrapper type and “li” as the list element type. 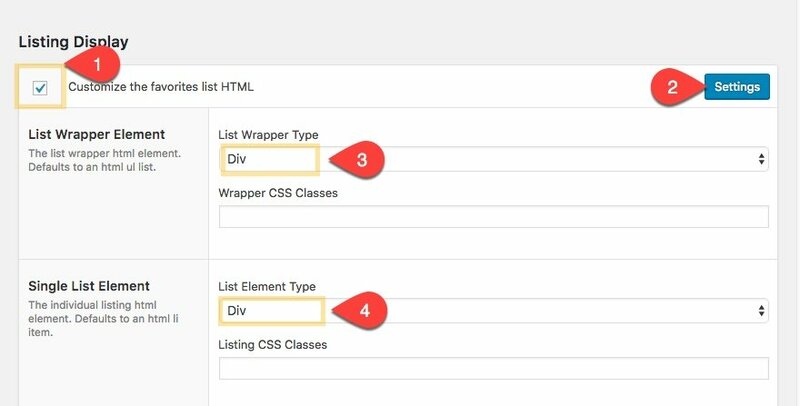 However, I find it more difficult to style the default setup with Divi, so instead, set the List wrapper type to “Div” and the List Element Type to “Div”. Next, select to Customize the single Listing Content Markup. 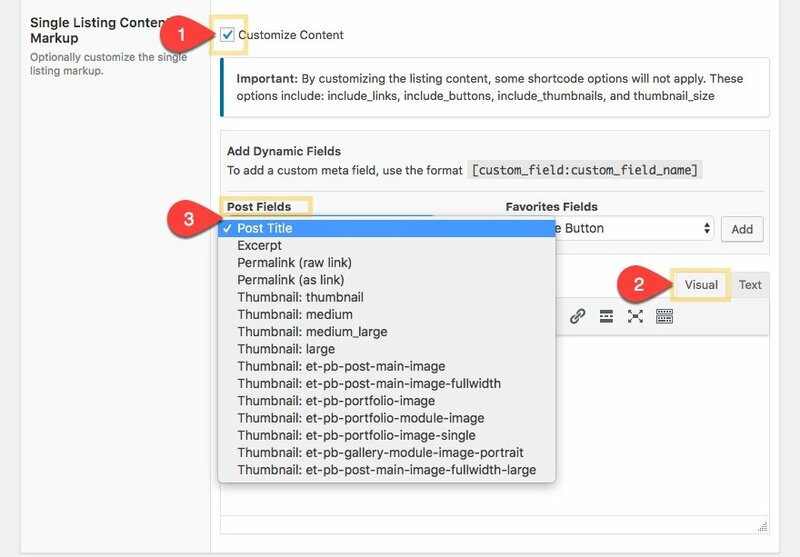 You will see a wysiwyg editor to customize what listing content you want to show when using the favorites listing shortcode. 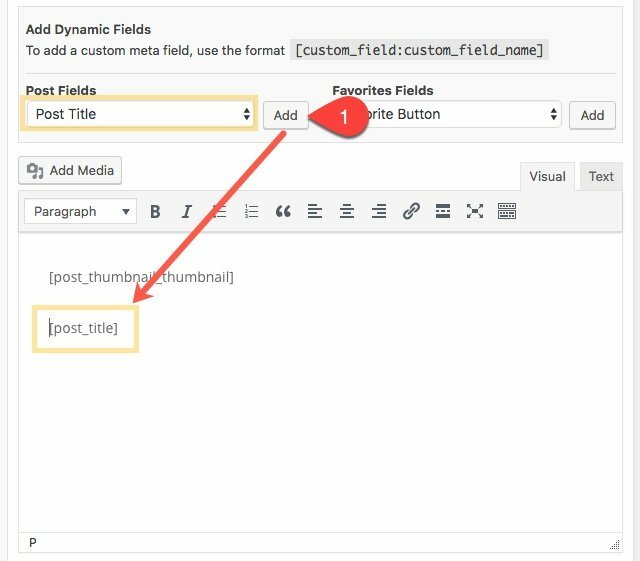 You can add dynamic fields by choosing them from the dropdown list and they will be added to the content editor box. 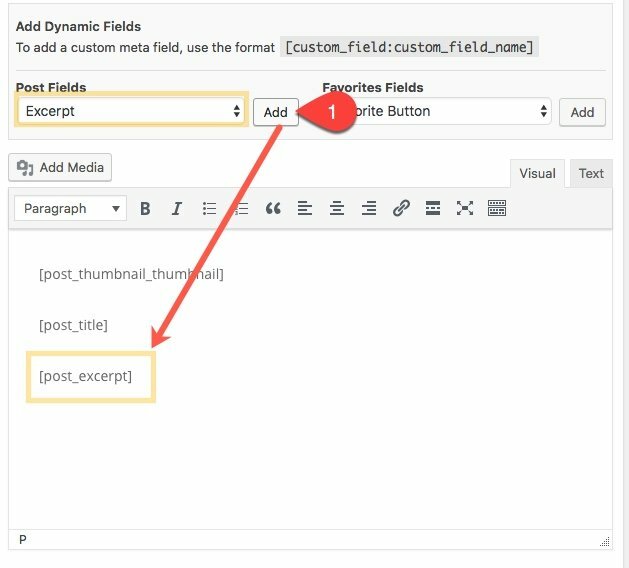 Make sure you have the visual tab selected when added the dynamic fields (it may not work with the text tab selected). The will show the thumbnail (featured image) you have selected for the project post. This will show the post title of project post. 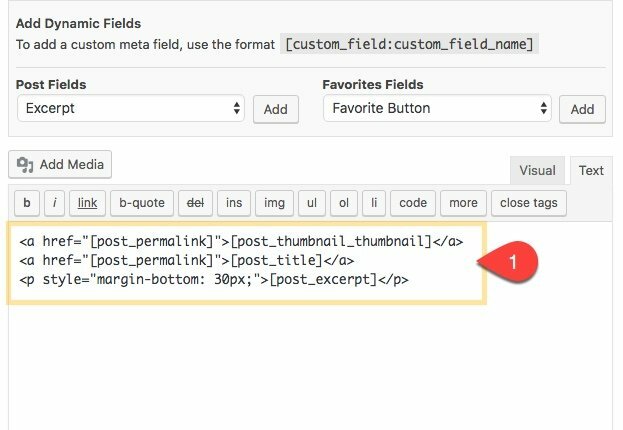 If you plan on giving your posts a custom excerpt, you can add the “Post Excerpt” field as well. This is a great way to provide some info about the favorited listing/pet that users can see in their favorited list. 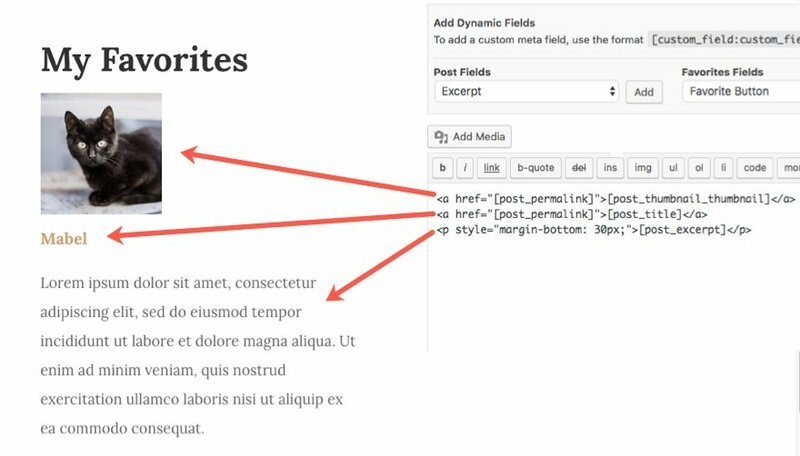 Note: I wrapped the post excerpt field with a paragraph tag and added some bottom margin to create a little space between the listed items. Once done, save your settings. Here is a sneak peak of what this output will look like whenever we use the shortcode to show user favorites. I’m keeping the default functionality of the favorites plugin under the General and Users tab. By default the plugin enables anonymous users (users not logged in) to have favoriting functionality by saving favorites as cookies. If you want to force users to login before favoriting, you can do this under the Users tab. Now we are ready to start creating our project posts to serve as our individual pet listings. 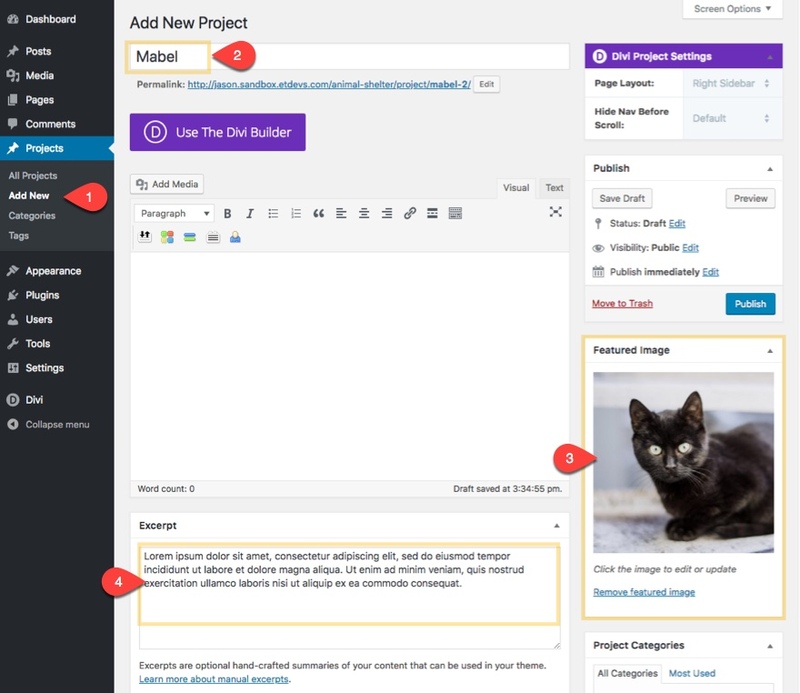 To add a new project, go to the WordPress dashboard and navigate to Projects > Add New. Enter a title for your post (ie. the name of the pet), add a featured image, enter the content you want to display in the listing page in the excerpt box. 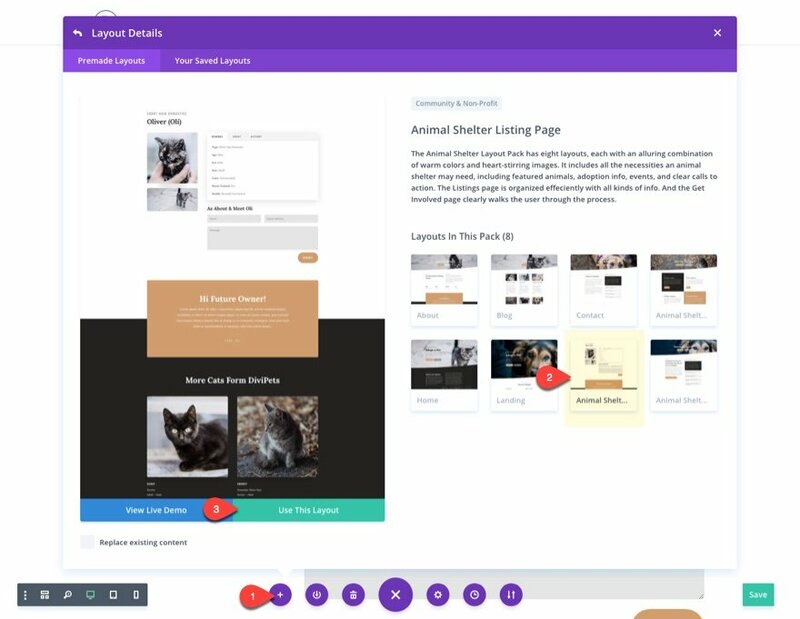 Next we need to add our premade listing page layout from the Animal Shelter Layout Pack. To do this, first deploy the visual builder. 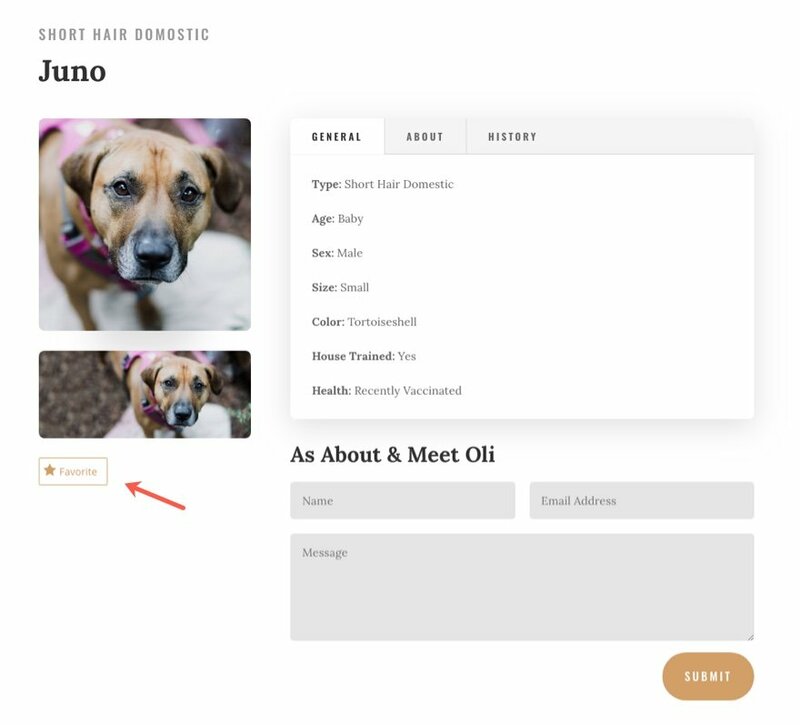 Open the settings menu and add the Animal Shelter Listing Page Layout to the post. You can add the favorite button anywhere on the page by using a shortcode. For this use case, let’s add it right under the photos in the left column in the first section. This is the most basic usage of the shortcode. There are a few additional parameters you can add to the shortcode to customize the functionality. You can check those out on the plugin page or their main website for more examples and shortcodes. All that is left to do is update the content of the post as needed and you are done. Save settings. Tip: You may want to save your text module with the favorite button shortcode as a global item in order to make it easier to add and edit the button on all listings. Once a user clicks on a button to favorite a post, the post is saved (using cookies) and is able to be listed anywhere on your site using a shortcode. For this use case, I’m going to create a new page to list those posts that have been favorited. Create a new page (Pages > Add New). Give the page a title (ie. “Favorites”). And deploy the visual builder. 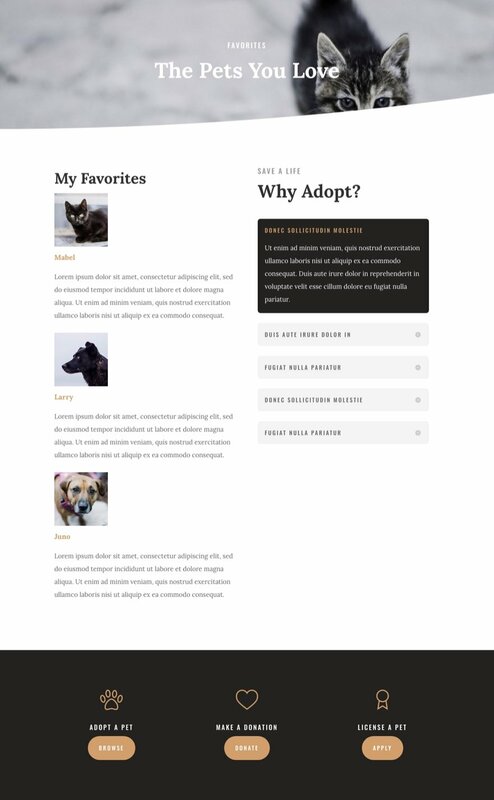 Next, add the Animal Shelter About Page layout to the page. Update the Fullwidth Header Module settings at the top of the page to include a new title and subheading text. Then delete the button text for both buttons. At this point, all you have to do is decide where you want to add the shortcode and which elements of the layout you want to keep (or rearrange) to design your page. This user favorites shortcode will display all of the user’s favorites they have selected. 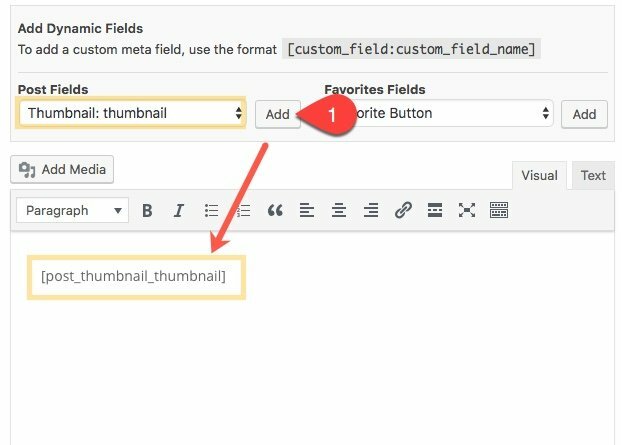 Now you can add additional elements to the right column if you want and delete the rest of the layout elements you don’t need. Favorites will only show on this page if the user has favorited posts. Here is what the page looks like with three posts favorited by the user. 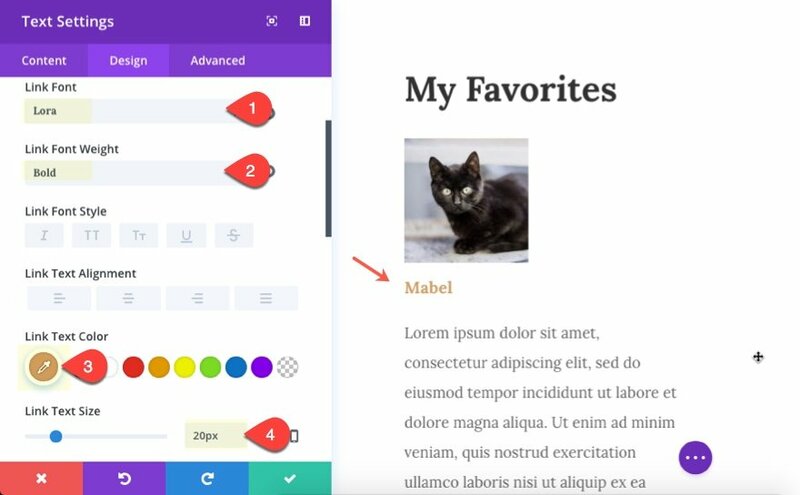 The good thing about the favorites plugin is that it is designed for developers, but this can also be challenging for those not comfortable with a little html/css. But for Divi, it seems to be a nice option to get the favorite button functionality up and running without too much customization. There are more options and shortcodes available if you want to add more functionality so feel free to check those out. It goes without saying that this plugin will work for many different use cases, not just for favoriting animals for an animal shelter. This would also work well for traditional blog posts or products. This is really cool, but I wish more of these tutorials had less plugins and more code. Nice one thanks 🙂 The same can be applied for the real estate layout I quess right? It looks like the https://wordpress.org/plugins/favorites/ plugin has Not been supported in over a year and support request are saying it’s not working properly or at all on some sites. It shows 1 out of 10 support tickets resolved in the past 2 months and that one request was resolved by the person requesting help on that issue. Is there another up to date plugin that will work to do the same thing and work with Divi? Lot’s of work went into writing this post. Only thing, as Commenter: Michael stated, I also noticed that Favorites plugin has not been updated for 12 months and only tested in WP 4.8.6. Isn’t this normally a Red Flag as far installing this plugin? That can easily be a red flag for me. Please don’t recommend outdated plugins. Outdated plugin but interesting concept.